Pro athletes have often dealt with the challenge of family members and friends asking for financial help. But longtime Miami Heat forward Udonis Haslem has an alternative for those in need of money — he can give them a job. “I have an opportunity to provide some new jobs to people in my city of Miami,” Haslem recently told The Undefeated. “It’s crazy. I just hired one lady that went to school with my dad. That felt good. I hired my best friend’s sister and he is also my driver now. If any Miami kid was in need of a role model on and off the court, they could look no further than Haslem. Haslem was born in Miami less than 10 miles from where the Heat now play. He grew up in the Liberty City neighborhood of Miami, which is ridden with violence and crime. Haslem won two state titles at Miami High School in 1997 and 1998 while playing with former NBA guard Steve Blake and being coached by the University of South Carolina men’s basketball coach Frank Martin. He went on to play for the University of Florida from 1998-2002 and studied leisure service management. Udonis Haslem #40 of the Miami Heat shoots against Joakim Noah #13 of the Chicago Bulls during the game on April 9, 2015 at AmericanAirlines Arena in Miami, Florida. However, the 6-foot-8 star wasn’t drafted into the league out of college. With the NBA uninterested, he played for France Chalon-Sur-Saone during the 2002-03 season and lost 50 pounds. He returned back home to Miami for good, signing with the Heat in 2003 and has been on the team ever since. “My story started in France,” Haslem said. “I had a great college career. Did what I was supposed to do. Stayed out of trouble. And I didn’t get drafted. I went all the way around the world and then had the opportunity to sign with the Heat. Haslem has more than taken advantage of his lengthy time with the team, becoming one of the most notable players in Heat history. Haslem earned a NBA championship with Shaquille O’Neal and Dwyane Wade in 2006 and two more with Wade, LeBron James and Chris Bosh in 2012 and 2013. He is in the midst of his 14th season with the Heat and is the franchise’s all-time leader in rebounds. 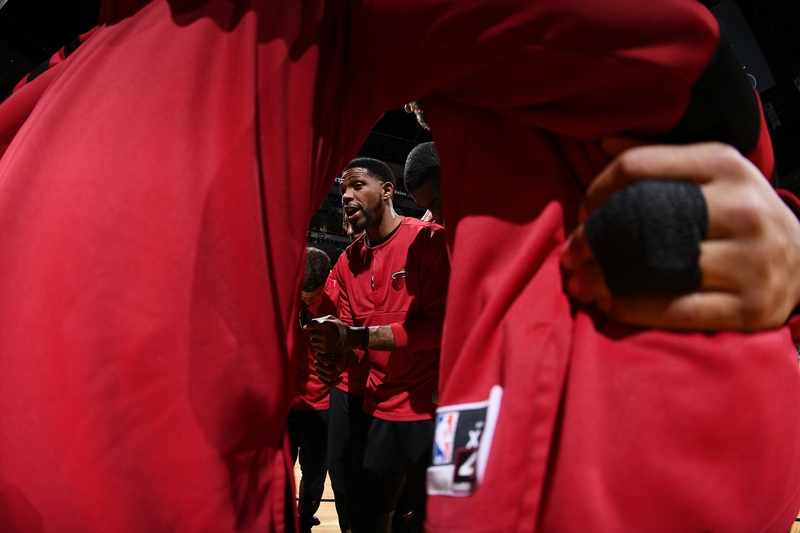 He has played in 828 regular-season games, just 27 games shy of tying Wade’s Heat record of 855. The Heat has retired both O’Neal’s and Alonzo Mourning’s jerseys and will likely retire Wade’s down the road, too. Haslem’s jersey can also easily be considered a possible candidate. “There is a lot to talk about that. Right now, I am still enjoying the opportunity to play the game,” he said. “Trust me, when I can’t compete at a high level and I can’t keep up, I’ll be the first to step away. I got too much pride. I got too much. I got too much love and joy for the organization. Haslem is one of the few players left of the Heat’s last championship team since James and Wade are now gone and Bosh may never play again due to blood clots. The Heat is now struggling as one of the worst teams in the NBA. With a 15-30 record, the team is back in rebuilding mode with young, talented players such as Hassan Whiteside, Justise Winslow, Goran Dragic, Tyler Johnson and Josh Richardson. Through the transition, Haslem has been the veteran who has kept the locker room professional despite not being on the court as often. “I wouldn’t change it, because every year and every opportunity I’ve been in, I’ve learned more about myself,” he said. “I had an opportunity to play with some of these great players and then settle into a more backseat role player and had to step up when my number was called. People don’t know how hard that is. You get into a playoff series and you really haven’t played that much and then all of the sudden Game 6 in Indiana, you got to be the guy that steps up. For years, Wade was the leader of the Heat on and off the court as he set up dinners and other off-court functions for his teammates. With Wade now gone to the Chicago Bulls after a lengthy Heat career, Haslem has stepped up to fill that void. The big Miami Dolphins fan has set up team trips to the movies, dinner and a Dolphins game this season. Udonis Haslem of the Miami Heat huddles with the Miami Heat before the game against the Denver Nuggets on Nov. 30, 2016, at the Pepsi Center in Denver. “He brings it every day and he’s still passionate,” Dragic told The Undefeated. “What I like the most about him is he’s always giving back. Maybe this season we are not giving back to him so much in playing time. He’s always there to give back to young players. Haslem, 36, is in the final year of his contract with the Heat paying $4 million. He hopes to finish his career with Miami and join the likes of recent NBA retirees Kobe Bryant and Tim Duncan as well as Dirk Nowitzki, who have had long careers with one NBA franchise. Haslem has long been prepared for the end of his NBA career, as he has Miami-area business ventures that are already thriving and growing. Haslem says he has majority ownership in five Subway franchises and two Auntie Anne’s Pretzels franchises in Miami-Dade and Broward counties. He is a partner in JFC Miami Management Holdings, where he is a co-licensed operator of an Einstein Bros. Bagels and a 24-hour Starbucks at Miami’s Jackson Memorial Hospital with one more of each on the horizon. He also has some pizza franchises in the works that he plans to bring to Miami soon. He credited Wade’s past business success as his motivation. Haslem also has a mentor in Ramona D. Hall, the managing partner of JFC Miami Management Holdings. Hall is responsible for daily business operations and brand relationships of JFC Miami Management Holdings. She is also active in new business development, positioning the company and brands for opportunities in nontraditional settings in airports, train stations, hospitals, university and college campuses. 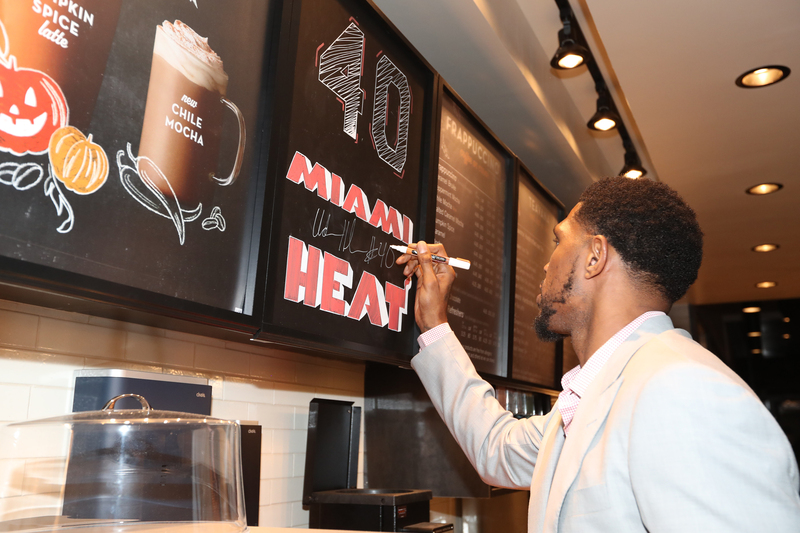 Miami Heat’s Udonis Haslem signs autograph on the wall behind the Starbucks counter at the VIP preview of Starbucks hosted by Haslem and Ramona Hall at Jackson Memorial Medical Center on Oct. 24, 2016, in Miami. “We actually became business partners after we both lost a bid [at Jackson Memorial Hospital] and through that she saw that I was passionate about what I was doing,” Haslem said. “I saw that she had a lot of knowledge and a lot of experience about the business she was in. We kind of took to each other. She was mentoring me. I was like a sponge. Haslem’s passion on the court has transferred to his business ventures as well. He is often on conference calls and reading e-mails during his downtime with the Heat. He has shown up at his Starbucks at 4 a.m. after flying in from Heat road trips to check in unannounced. He has even had the difficult duty of having to make the call on firings.